Alexander Fleming discovered penicillin, whose use as an antibiotic has saved untold millions of lives. Less well-known is that before making this world-changing discovery, he had already made significant life-saving contributions to medical science. Alexander Fleming was born on August 6, 1881 at his parents’ farm located near the small town of Darvel, in Scotland, UK. His parents, Hugh Fleming and Grace Stirling Morton, were both from farming families. His father’s health was fragile; he died when Alexander was just seven years old. Alexander’s earliest schooling, between the ages of five and eight, was at a tiny moorland school where 12 pupils of all ages were taught in a single classroom. Darvel School was Alexander’s next school, which involved an eight-mile round trip on foot every school-day. At the age of 11 his academic potential was recognized and he was awarded a scholarship to Kilmarnock Academy, where he boarded for about two years before leaving for London. Alexander arrived in London early in 1895, age 13. This was the year his fellow Scot, Arthur Conan Doyle, published The Memoirs of Sherlock Holmes, in which readers were horrified to learn their hero had died falling into the Reichenbach Falls. Alexander lived in the home of his elder brother, Tom, who was a doctor of medicine. Most of the Fleming family ended up living with Tom, leaving the eldest brother, Hugh, running the farm. Alexander attended the Polytechnic School, where he studied business and commerce. He started in a class appropriate to his age, but his teachers soon realized he needed more challenging work. He was moved into a class with boys two years older than him and finished school at the age of 16. Alexander’s business training helped him get a job in a shipping office, but he did not enjoy working there. In 1901, at the age of 20, he inherited some money from his uncle, John Fleming. He decided to use the money to go to medical school; he wanted to become a doctor like his successful brother Tom. First, he needed suitable qualifications to enable him to enroll at medical school. This did not present any great difficulties; he passed his exams with the highest marks of any student in the United Kingdom. In 1903, age 22, Alexander enrolled at London’s St Mary’s Hospital Medical School, graduating with distinction three years later as Bachelor of Medicine, Bachelor of Surgery. Rather than follow in Tom’s footsteps, Alexander was persuaded by Almroth Wright, an authority in immunology, to become a researcher in his bacteriology group at St Mary’s Hospital Medical School. While carrying out this research Fleming graduated, in 1908, with a degree in bacteriology and the Gold Medal for top student. St Mary’s Hospital Medical School then promoted him to the role of bacteriology lecturer. Almroth Wright was interested in our bodies’ natural ability to fight infection. Fleming became particularly fascinated by the fact that although people suffer bacterial infections from time to time, our natural defenses usually prevent infections from taking hold. In 1914 World War 1 broke out and Fleming, age 33, joined the army, becoming a captain in the Royal Army Medical Corps working in field hospitals in France. There, in a series of brilliant experiments, he established that antiseptic agents used to treat wounds and prevent infection were actually killing more soldiers than the infections were! The antiseptics, such as carbolic acid, boric acid and hydrogen peroxide, were failing to kill bacteria deep in wounds; worse, they were in fact lowering the soldier’s natural resistance to infection because they were killing white blood cells. Fleming demonstrated that antiseptic agents were only useful in treating superficial wounds, but were harmful when applied to deep wounds. Almroth Wright believed that a saline solution – salt water – should be used to clean deep wounds, because this did not interfere with the body’s own defenses and in fact attracted white cells. Fleming proved this result in the field. Wright and Fleming published their results, but most army doctors refused to change their ways, resulting in many preventable deaths. 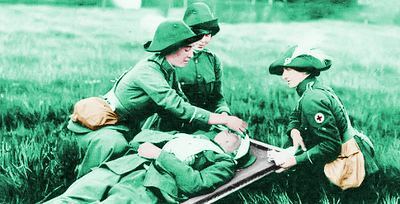 Nurses come to the aid of a wounded soldier. Fleming saved many soldiers’ lives in World War One by washing deep wounds with saline solution rather than the antiseptics recommended by medical textbooks. In 1919 Fleming returned to research at St Mary’s Hospital Medical School in London. His wartime experience had firmly established his view that antibacterial agents should be used only if they worked with the body’s natural defenses rather than against them; in particular, agents must not harm white blood cells. His first discovery of such an agent came in 1922, when he was 41 years old. Fleming had taken secretions from inside the nose of a patient suffering from a head cold. He cultured the secretions to grow any bacteria that happened to be present. In the secretions, he discovered a new bacterium he called Micrococcus lysodeikticus, now called M luteus. A few days later, Fleming was examining these bacteria. He himself was now suffering from a head cold, and a drop of mucus fell from his nose on to the bacteria. The bacteria in the area where the drop fell were almost instantly destroyed. Always on the lookout for natural bacteria killers, this observation excited Fleming enormously. He tested the effect of other fluids from the body, such as blood serum, saliva, and tears, on these bacteria and found that bacteria would not grow where a drop of one of these fluids was placed. Fleming discovered the common factor in the fluids was an enzyme. He named his newly discovered enzyme lysozyme. The effect of lysozyme was to destroy certain types of microbe, rendering them harmless to people. The presence of lysozyme in our bodies prevents some potentially pathogenic microbes from causing us harm. It gives us natural immunity to a number of diseases. However, lysozyme’s usefulness as a medicine is rather limited, because it has little or no effect on many other microbes that infect humans. Fleming had discovered a natural antibiotic that did not kill white blood cells. If only he could find a more powerful antibiotic, then medicine could be transformed. Today, lysozyme is used as a food and wine preservative. It is naturally present in large concentrations in egg-whites, offering protection to chicks against infection. It is also used in medicines, particularly in Asia, where it is used in treatments for head colds, athlete’s foot, and throat infections. 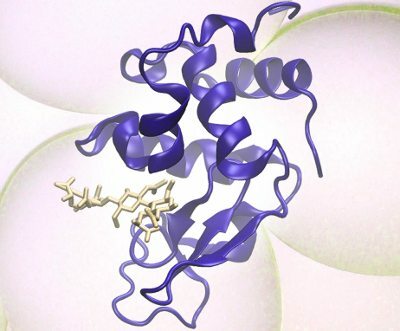 Lysozyme is shown here in blue. It is an enzyme, meaning it is a type of protein. It destroys bacteria by breaking down their cell walls, shown in pink. In the month of August 1928, Fleming did something very important. He enjoyed a long vacation with his wife and young son. On Monday, September 3, he returned to his laboratory and saw a pile of Petri dishes he had left on his bench. The dishes contained colonies of Staphylococcus bacteria. While he was away, one of his assistants had left a window open and the dishes had become contaminated by different microbes. Annoyed, Fleming looked through the dishes and found something remarkable had taken place in one of them. A fungus was growing and the bacterial colonies around it had been killed. Farther from the fungus, the bacteria looked normal. Excited by his observation, Fleming showed the dish to an assistant, who remarked on how similar this seemed to Fleming’s famous discovery of lysozyme. Hoping he had discovered a better natural antibiotic than lysozyme, Fleming now devoted himself to growing more of the fungus. He identified that it belonged to the Penicillium genus and that it produced a bacteria-killing liquid. On March 7, 1929 he formally named the antibiotic penicillin. Fleming published his results, showing that penicillin killed many different species of bacteria, including those responsible for scarlet fever, pneumonia, meningitis, and diphtheria. Furthermore, penicillin was non-toxic and it did not attack white blood cells. Unfortunately, the scientific world was largely underwhelmed, ignoring his discovery. Fleming’s boss, Almroth Wright, had a generalized dislike of chemists and refused to allow them in his laboratory. The presence of a skilled chemist would have been a huge benefit in terms of isolating, purifying, and concentrating penicillin. Regardless of these issues, Fleming continued with some work on penicillin in the 1930s, but never made the breakthrough he needed to produce it in large, concentrated quantities. Others, however, did. In the early 1940s a team of scientists led by pathologist Howard Florey and biochemist Ernst Boris Chain at the University of Oxford transformed penicillin into the medicine we know today. Fleming was always fulsome in his praise for Florey, Chain, and their team, and he downplayed his own role in penicillin’s story. Despite his modesty, he became a worldwide hero. Millions of people owed their lives to the antibiotic he had discovered. In 1945 he toured America, where chemical companies offered him a personal gift of $100,000 as a mark of respect and gratitude for his work. Typically of Fleming, he did not accept the gift for himself: he donated it to the research laboratories at St Mary’s Hospital Medical School. In 1915, while a captain in the Medical Corps, Fleming married Sarah Marion McElroy. Their only son, Robert, became a general medical practitioner. In 1944 Fleming was knighted and became Sir Alexander Fleming. His wife Sarah died in 1949. In 1953 Fleming married Dr. Amalia Koutsouri-Voureka, who was working in his research group at St Mary’s Hospital Medical School. 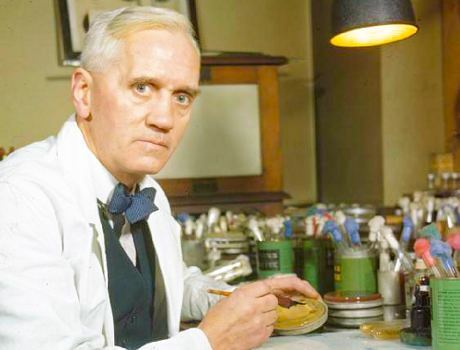 On March 11, 1955 Alexander Fleming died age 73 in London of a heart attack. His ashes were placed in St Paul’s Cathedral. "Alexander Fleming." Famous Scientists. famousscientists.org. 09 Jul. 2015. Web.